Founded in 1824 by Alexander Raid The 390-acre Macallan Estate lies in an area of natural beauty and is farmed sensitively, in harmony with the environment. Since then, The Macallan has built a reputation as one of the world’s leading single malt whiskies. The creation of The Macallan draws on the vital contributing influences of Spain, North America and Scotland – and their respective natural raw materials, combined with traditional methods, and craftsmanship. The reputation of The Macallan is built on a product of outstanding quality and distinctive character, founded upon a set of guiding principles called the Six Pillars. The value encompass the strong sense of place at the heart of The Macallan distillery, together with long experience of distilling and maturing a single malt whisky. From places to process, people and passion, the Six Pillars are the backdrop to The Macallan unique spirit. 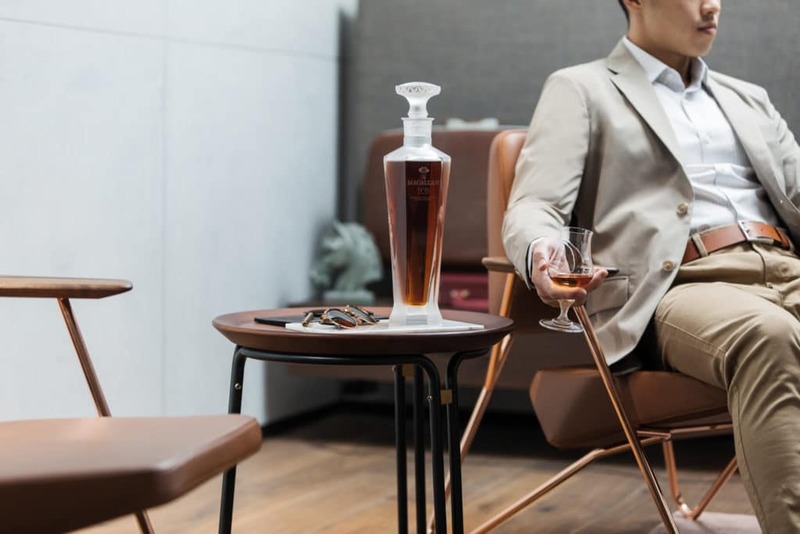 The Macallan has unveiled The 1824 Master Series featuring a range of stunning decanters. The range includes Rare Cask, Reflexion, No. 6, and M. Natural colour and sherry seasoned oak casks come together masterfully in this commanding series. Taking inspiration from The Macallan’s iconic triangle and a desire to showcase the whiskies’ stunning and natural colours, the style and design of each decanter beautifully showcases the peerless spirit that defines The Macallan. No. 6 brings together the art of whisky making with Lalique exquisite craftsmanship to create a stunning whisky encased in the finest crystal decanter. This rich, complex single malt takes its unique natural colour and character from first-fill sherry-seasoned oak casks from Spain, handcrafted by the master craftsmen of Jerez de la Fontera, the home of sherry. The casks are taken from a single cooperage in order to ensure the infinite quality and character at the heart of this rich single malt. The cooperage exclusively creates Spanish oak casks, which once seasoned with sherry, create the unique flavor of the exquisite whisky. Rich in spice and dried fruit with a layer of heady oranges groves, this is an enticing, dark, whisky that delivers classic Macallan character. Today The Macallan’s reputation for quality and distinctive character is appreciated by increasing numbers of connoisseurs and collectors around the world, building on the work of the past masters for the enjoyment of future generations.